If southern Thailand was all about relaxation and Malaysia was all about food, then Cambodia is definitely the place of contrasts and extremes. Whereas Siem Reap and the temples of Angkor celebrate Cambodian creativity, spirituality, and diligence, Phnom Penh seems like a city that is trying to move on from the many horrors of the Khmer Rouge and rule under Pol Pot, but is still faced the realities of that dark period every day. On the bus from Siem Reap to Phnom Penh (more on that adventure later), I was deeply involved in the book First They Killed My Father by Luong Ung, a story of a middle-class Cambodian family that was torn apart during Communist rule. It is a first-hand account of what happened to many people during Pol Pot’s regime: hard labor, starvation, and genocide. 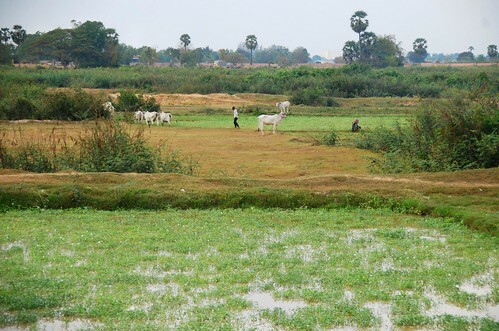 Cambodian people of all ages were sent to work in the countryside, growing and harvesting rice, so that Pol Pot’s ridiculous goal of tripling the country’s rice production could be achieved. Field leaders sent off the bulk of their crop for export rather than admit that they could not reach the harvest goal, and the people working in the fields went hungry. There was no medicine, no school—even the family unit was seen as a relic of the bourgeois past. I almost cried a couple of times reading that book, and I felt very lucky—not only that people of our generation have never had to suffer through a regime change like that, but that the US has not had to deal with the effects of an extended war on our own soil for over 150 years. We visited both the Killing Fields and Tuol Sleng prison, and both of us felt that the prison was by far the more powerful of the two. First of all, it was formerly a school, so the settings were very institutional, which made the whole thing even more disturbing. 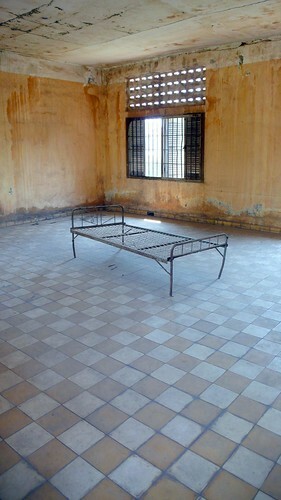 You begin the visit in one building, where each room is set up with a single bed, perhaps some chains, and a photo on the wall of a prisoner in one of these beds after a “questioning session” (I cropped out the photo on the wall in the picture below for obvious reasons). It is shocking and moving and horrifying all at once, and the place is made even more eerie by the fact that everyone is shuffling through these rooms in complete silence. Torture room at Tuol Sleng Prison Museum (S21). In the next building, you come face to face with the people who suffered in this awful place—there are large bulletin boards with black and white photos of prisoners who once lived here. Some of them look defiant, some of them look like they have already given up, and all of them look like ghosts. 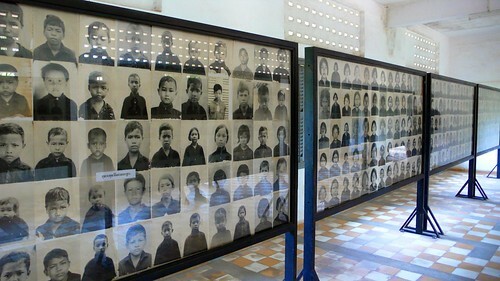 The faces of Tuol Sleng. One of the most interesting exhibits at Tuol Sleng was a series of photographs taken by a Swedish man who visited Cambodia during Pol Pot’s rule. He was escorted around the country (along with 9 other Swedish delegates) by the Khmer Rouge, and the Communists essentially put on a show for the Swedes, in order to display the “success” of the Communist experiment in Cambodia. At the time, like some liberal Europeans and Americans, this Swedish man supported Communism and desperately wanted to see it work, so he bought the whole dog-and-pony show hook, line, and sinker. He has since seen the error of his ways and the exhibit starts with a letter of apology from him; he laments his mistakes and asks for forgiveness. Each room contains photos from his trip and is captioned by what he thought then (during the tour), and what he thinks now of the things he was shown. Part of the reason why we thought Tuol Sleng was more powerful than the Killing Fields was this human face that was put on the story, both from within (the faces on the bulletin boards) and from the outside (the Swedish man’s photo exhibit). The Killing Fields is about 15 km outside of the busy city of Phnom Penh, set in the countryside. The peaceful surrounds made it was difficult for us to imagine the horrors that happened here, despite the fact that the walkway is still littered with pieces of clothing and even bones from the victims (very heavy). I’m not sure if this admission makes us seem like heartless cads, but it’s the truth, and perhaps it is just a byproduct of our safe and protected lives growing up in the US that we can’t even imagine a political power inflicting this type of atrocity on its own people. The Cambodian countryside near the Killing Fields. 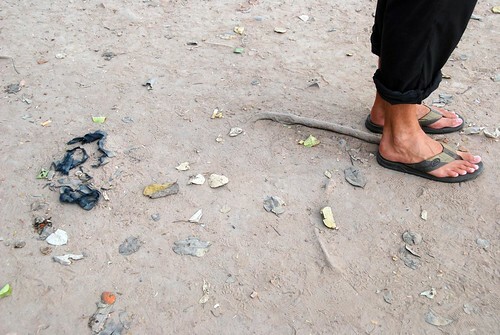 Bits of clothing still buried underfoot at the Killing Fields. To sum it up, our experience of Cambodia was different than other parts of SE Asia because our feelings about it were never simple, like “I love this place!” or “I don’t really like this place.” More often our thoughts ran more along the lines of “I like this place but this part of it is disturbing to me” (Siem Reap), or “This place should really be challenging me but I am not reacting to it the way I should be and what does that say about me as an outsider?” (the Killing Fields). In other words, Cambodia was complicated. And I have to admit, I don’t think it should be any other way. In general, I would say that SE Asia has been a challenge. Not in the literal way, because travel here is quite easy, but it’s just never what we expect. Each country we have visited so far on this trip teaches us something different about ourselves. In New Zealand, we were finding our groove, changing our routine and finding a new one in a different land. In Australia, I was learning how to find peace in an uncluttered day, getting accustomed to a life without endless to-do lists and never-ending projects (I realize this sounds silly, but it was a major change that took some getting used to). SE Asia has been all about never expecting one thing because then we will surely get the other. So thanks, Cambodia, for keeping us on our well-traveled toes. Through traveling you have learned the meaning of life. it’s great. There are many different spicies of animals and vegetations. Try some of the exotic tropical fruits there. Your first paragraph says it all to me: contrasts and extremes. We felt that Cambodia seems to be in the confusing process of catching up with itself in so many different ways. There certainly is a wealth of emotionally moving (and draining) stuff there. It sounds like it will stay with you for a long time, which is both good and bad. Plenty of amazing visuals, for sure, but also a lot of other things that bang around in your head. Miss you guys, as always - stay safe and healthy, and clean your well-traveled toenails. Your experience in Cambodia reminds me a lot about living here in Germany. A lot of people come here BECAUSE of what happened during WWII, which I also think is completely strange. Many of the concentration camps here are open to the public where you can see the gas chambers, ovens, fields where mass graves are, etc. I know you said that the Japanese now run the site rather than the Cambodians, but maybe it’s similar to the Germans’ mentality that without these sites being left the way it is, the events and victims would be forgotten. Germans also leave it as a reminder of what happened and how we as humans can’t let it happen again. Thanks to you guys, I’m learning a lot about places and cultures to which I’ve never really given much thought. Thanks for that. Stay safe and keep on truckin’.